Ghost, at last. The direwolf looks a bit bigger than we last saw him. It is, of course, something of an oddity that they’ve left him with the Night’s Watch rather than with Jon Snow, which is a change from the novels. 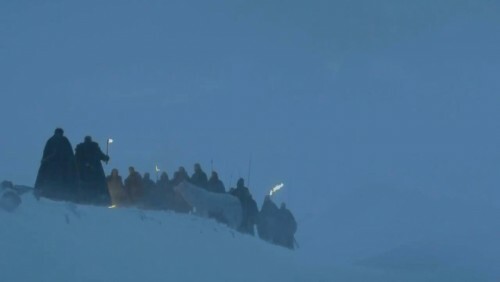 It doesn’t make a great deal of sense, story-wise, but we’re assuming it was something to do with being able to justify very brief glimpses of Ghost in the Night’s Watch scenes, budget-wise, but not being able to do so in more involved and extensive Jon Snow scenes. We’ll see how it pans out.